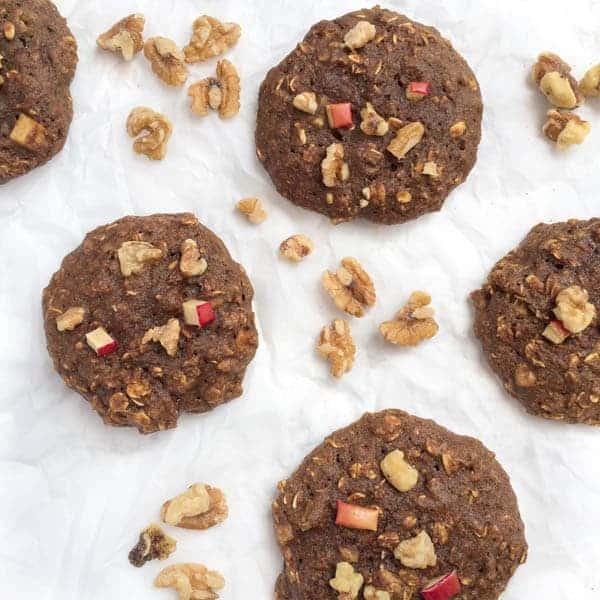 The perfect portable make-ahead breakfast, these chewy oatmeal apple breakfast cookies are energy packed and lightly sweetened to make them loved by all! Can I get a quick fist pump for fall baking season? It is my favorite time of year for baking because it centers around two of my most beloved ingredients: apples and pumpkins. 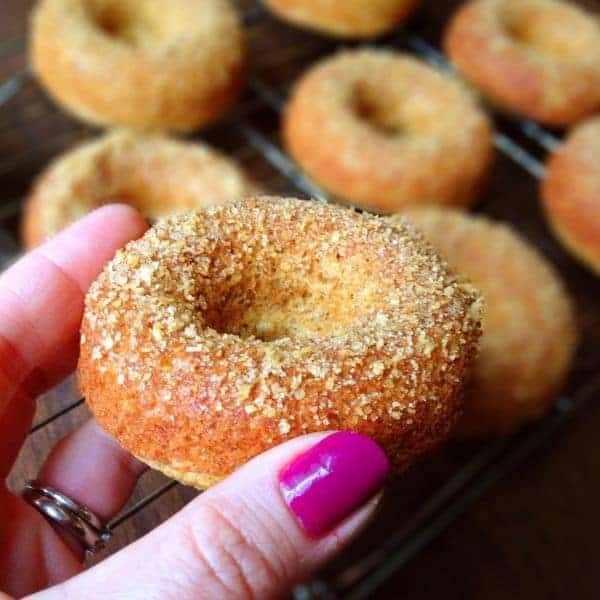 Pumpkin muffins, apple cider donuts, you name it, I’m finding a way to make it healthier with apples and pumpkins. My secret weapon? Molasses! Thick, syrupy and 100% fall, I love using molasses in baked goods. 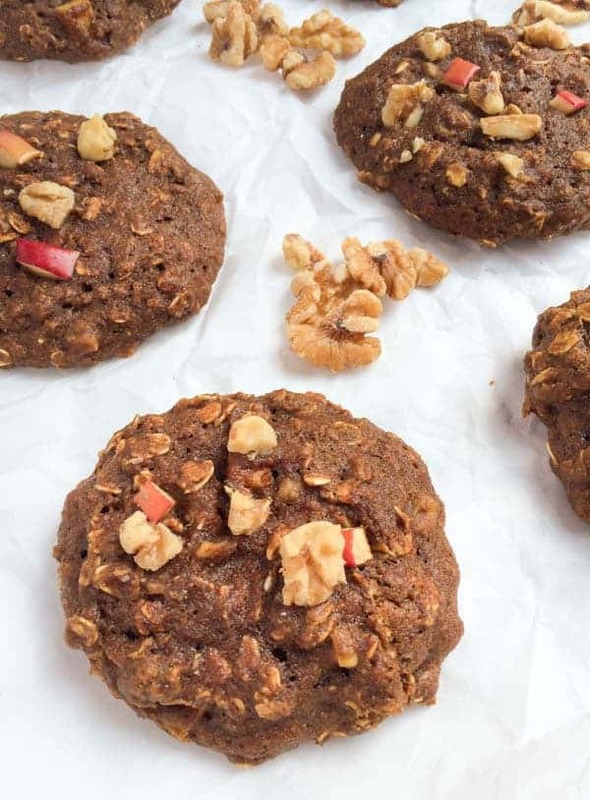 With school back in session, I wanted to create a fun and portable breakfast cookie that was high in flavor, low in sugar. 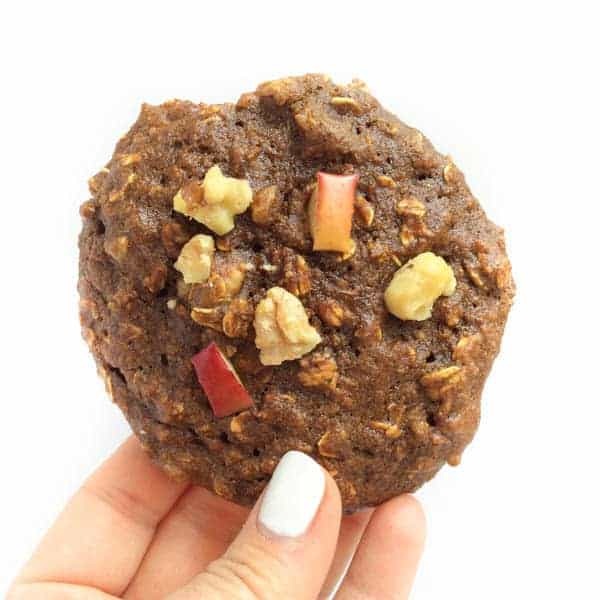 Packed with whole grains, healthy fats and protein, these chewy apple oatmeal breakfast cookies are an ideal make-ahead breakfast or lunch box treat. When served with a tall glass of milk you get over 12 grams of protein per serving – just the type of energy kids need to get through their school day. What are your favorite ways to bake with apples? I’d love to hear from you! Pre-heat oven to 350 degrees and line two baking sheets with silicone baking mats. In a large bowl, whisk together dry ingredients: oats through salt. In a separate medium bowl, whisk together wet ingredients: eggs through vanilla. Slowly stir the wet ingredients into the dry and stir until evenly incorporated being sure to scrape down the sides of the bowl with a rubber spatula. Fold in the diced apples and chopped walnuts. Use a large cookie scoop to scoop out batter on prepared baking sheets leaving 2 inches in between each cookie. Gently press batter with fingers to flatten slightly. Bake cookies for 10-12 minutes or until centers are firm to touch. Cookies can be stored in an air-tight refrigerated container for up to 7 days. Cookies freeze well when wrapped individually in plastic wrap. Want more easy breakfasts? Check out my Healthy Breakfast Ideas board! Hi Melissa – Hmm… maybe it was the cloves! I love that spice but it’s not for everyone. Feel free to omit next time! Glad you enjoyed!! Any recipe that gets cookies in my face first thing in the morning is a recipe I need in my life! Love that these are so fall-infused. I’ll fist bump for anything with applies + pumpkin! Love the sound of this recipe. Pinning to my Everything Apples board. What’s better then a cookie for breakfast? Nothing! Okay, maybe a tater tot, but these cookies look off the chizzzzarts. hahaha Tots AND cookies maybe? Tot cookie? I think I’m on to something..
hahaha Isn’t fall baking just the best? These breakfast cookies sound delicious! I’m all about a cookie for breakfast – such a fun way to start the day. And what a great idea to use molasses – such great, deep flavor. Yum! I just can’t stop with the fall goodies!! It’s the best!